Avondale Shipyards, a subsidiary of Ogden Corporation, announced that it will double its repair capacity through the construction and equipping of an additional floating drydock and support facility. The new $50-million drydock will enable Avondale to undertake an increased volume of repair work not possible with its existing facilities. Avondale's repair facilities have been operating substantially at maximum capacity for the past 10 years, and their current revenues exceed $60 million annually. The new drydock will be capable of providing repair services for almost all vessels that call at the Port of New Orleans, and will be located at the Main Yard where it is expected to employ approximately 500 workers. It will be about 650 feet long and 150 feet wide, with a lifting capacity of 23,000 tons, and can be expanded if desired. 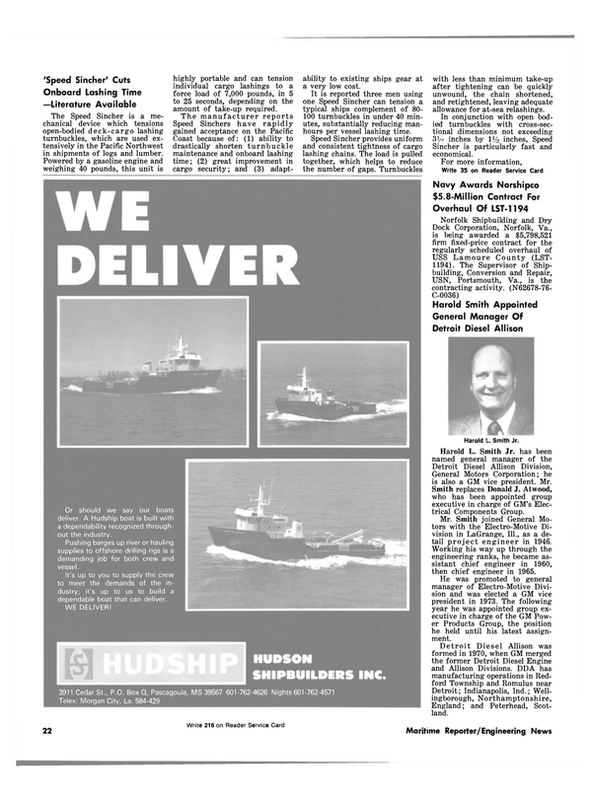 Albert A. Bossier Jr., Avondale's president, stated that there is substantial business for the new drydock, and that he expects it to be fully utilized as soon as it is available. Avondale also announced that it has received the preliminary approval of the Board of Commissioners of the Port of New Orleans to finance the new drydock with industrial revenue bonds.